BULLET-PROOF IS A WORD you'll hear often from Outback owners. And as most owners hang on to them for years, they should know. Its not just longevity they're referring to but how it takes on the world every single day  as its 'Outback' name implies, it will tackle just about most things you throw at it, from gnarly blacktop to flooded roads, muddy fields to rock-strewn mountain passes. Whatever, the Outback just gets on with it. Looks-wise it's an engaging blend of estate and SUV with a substantial 'hewn from rock' air. An impression strengthened by the brawny hexagonal grille that, flanked by 'hawk-eye' LED headlights, sits boldly above a full-width lower protective moulding incorporating circular fog lights. #Seen from the side, wheelarch-filling alloys underscore the Outback's all-road ground clearance; the rear flanks taper off in a rakish tail treatment that's subtly emphasised by quality-look chrome detailing around the swept-back glasshouse. The acid test? Park alongside a prestige-branded equivalent that costs perhaps £10K more and the Subaru looks every bit as good. This latest Outback impresses on the inside too with a smartly trimmed cabin with big, well-padded, heated leather seats that look particularly inviting; settle in one and you'll quickly find it is. Shut the door and there's a satisfying well-engineered 'thunk' as it closes first pull. Each front passenger 'zone' offers plenty of space around shoulders, elbows and legs, and there's a sociable distance between the front passengers. The driver sits high  SUV-like  in an eight-way powered chair with powered lumbar support, and it takes but seconds to set a perfect driving position that provides a fine view over and to both sides of the bonnet to the road ahead. Views through the back screen are equally clear while large side windows keep the cabin light and airy. Once set, a two-setting memory recall ensures you don't have to do it all again even if you share the driving. The three-spoke multifunction wheel comes with a meaty leather-wrapped rim that's feels particularly good in your hands. Paddle-shifters on the wheel make taking full control of the auto's gear changing a no-brainer. In 'dash central', pride of place goes to the large (eight-inch) hi-res touchscreen, set in a silver-edged glossy black panel that's home to the infotainment and navigation system and which offers the same touchscreen functionality as a smartphone, such as swiping and pinching-in and out to control the zoom on map displays. The screen is positioned high in the centre stack, where it's easily seen from the driver's seat. The SatNav is brilliant: the 3D mapping is well supported by timely and foolproof spoken directions, and there are equally good graphic prompts in the driver's display. The rest of the switchgear is logically arranged, and Sport and Intelligent driving modes are selected from the steering wheel. While there's a keyless Start button for the engine and electric parking brake, Subaru have, thankfully, stuck with tradition when it comes to the dual-zone climate control system, providing time-honoured knurled rotary knobs and buttons for heating and ventilation  so much easier and far less distracting than jabbing at a screen on the move. Voice control (just press the appropriate button on the steering wheel then speak) enables you to verbally choose your favourite music, set a new destination or change the settings of the climate control. Entertainment is taken care of by a six-speaker audio system with CD player, Bluetooth music streaming, and a DAB radio; pairing up smartphones and tablets is straightforward using Apple CarPlay and Android Auto. Driver information is comprehensive and easy to take in with hi-vis blue-highlighted speedo and rev-counter dials that are restful, each set in individual nacelles either side of a LCD display for everything from trip info and safety alerts to a digital speed readout and the posted speed limit. Good, also, to see the hazard warning button top dead centre of the fascia  more carmakers should follow suit. In-cabin storage is generous with big bottle-holding door bins, siamesed cupholders (with a removable divider should you prefer to use it as a deep tray), a large deep storage bin under the armrest between the front seats, a wide glovebox, and a big lidded 'cave' at the base of the centre stack with dual USB ports, aux-in jack and 12-volt power output. Kit-wise the Outback is well specced  in addition to many items mentioned elsewhere there's also keyless entry, exit and push-button start, powered sunroof with blackout blind, tinted windows with UV protection, powerfolding heated door mirrors, multi-view camera system, auto lights and wipers, electric windows, drive-off door locking, tyre pressure monitoring, LED headlamps with washers, windscreen wiper de-icer, a five-star EuroNCAP rating, front, side and curtain airbags plus a driver's knee airbag (the front seat airbag automatically deactivates when it detects a child seat), roof rails, and 18-inch alloys. The Outback's 4.9m long, 1.8m wide and 1.6m high boundaries enclose an indulgent amount of inner space, especially in the lounge-like rear cabin where there's masses of room for three adults with decent knee-, leg- and foot-room in comfortable seats. Your rear passengers also get a full fist of headroom. Nice, too, is the wide, well-padded central armrest and long padded outer armrests along with real-world size bottle-holding door bins, dedicated air vents, a pair of USB ports, and deep, long side windows, all of which help make the rear cabin a very relaxing place in which to cover the miles. Subaru uses 'Boxer' engines in its Outback which, being horizontally-opposed four-cylinder units, can be mounted lower in the engine bay  this contributes to a lower centre of gravity and benefits handling; it's also good for safety because in a severe frontal accident it's designed to slide harmlessly beneath the passenger compartment. is, in a word, soothingly. That aside, the 2.5-litre Boxer unit is normally aspirated and, without any help from a turbocharger, punches out 172bhp backed by a healthy 173lb ft. Partnered by a clean-shifting and responsive Lineartronic CVT automatic transmission, it makes for unruffled progress whether you're fighting you way through rush-hour traffic or pootling along open roads on a weekend break. Whatever your pace, the Outback serves up refreshingly de-stressed journeys. Another benefit of the 'flat' Boxer arrangement is the 'punch and counterpunch' (hence the 'Boxer' tag) action of the horizontally-opposed pistons which makes for a smoother-running powerplant. 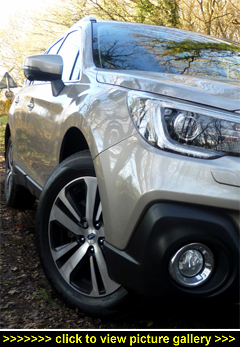 The Outback is a big 4x4 crossover estate but the power flow feels eager, particularly during mid-range acceleration. Off the line to 62mph is done and dusted in 10.2 seconds and top speed is a realistic 123mph. Officially the Combined Cycle consumption is 38.7mpg. Regular visitors know that MotorBar's testers don't try to eke out the fuel  but only so our figures are real-world representative  and a hard week's driving saw this large, all-wheel drive, CVT-autoboxed crossover return a very convincing 36.7mpg. Drive to all four wheels is though Subaru's permanent, symmetrical all-wheel-drive system  it's active at all times so traction and grip are not only impressive but always there when needed. And that's good news for handling, whatever the prevailing road conditions, especially when asked to change direction quickly. Body control is good and the independent suspension agreeably fettled, plus there's active torque vectoring to reduce understeer and oversteer and deliver a neutral line through corners. Taken together, these 'assists' endow this crossover family wagon with a very reassuring sure-footedness. Further boosting the Outback's all-roads and all-weather confidence is Subaru's Eyesight driver assistance suite  an advanced collision-avoidance system that incorporates six features including autonomous emergency braking, active lane keeping, and adaptive cruise control. Acting as a 'second pair of eyes' it uses stereo colour camera technology to monitor the road ahead for vehicles, cyclists, pedestrians and other potential hazards. Adding to the Outback's safety tally is Blind Spot Monitoring, Rear Cross Traffic Alert, High Beam Assist, and 'bending' headlights to boost night-time visibility. Cameras are also mounted at the front, sides and tail for increased all-round visibility; you can cycle through the various views using a button by the gear selector. With full-time all-wheel drive, 200mm of ground clearance, rough-road friendly approach, breakover and departure angles, and short overhangs, the Outback is perfectly at home in the 'outback'. Press the all-terrain X-Mode button and, regardless of your driving skills-set, you'll be safer on slippery surfaces and steep inclines, both on tarmac and off-road. X-Mode simultaneously manages the engine, transmission, all-wheel drive system, and the Vehicle Dynamics Control (Subaru's electronic stability control system), and also incorporates Hill Descent Control to ensure your speed remains constant when driving down steep, tricksy slopes. Handy, too, is the 180-degree front camera that displays on-screen images of the area in the driver's blind spot ahead of the car  while it's perfect for avoiding obstacles off-road, it's equally useful when parking at Sainsbug's. Given it's size and multi-role character, from full-on cargo-carrying workhorse to off-road capable family holdall, you might be surprised at how well the Outback rides  which is, in a word, soothingly. The damping has been improved and not much underfoot seems to unsettle it. Of course, it helps that its handling is composed and sure-footed, which in turn keeps passengers nicely cosseted. Confirming the Outback's load-lugging credentials is a cargo bay that will swallow 1,848 litres when the 60:40-split rear seatbacks are folded down. Loading couldn't be easier thanks to a fast-moving powered tailgate operated by either the key, a button in the cabin, or on the tailgate itself. Open, there's a wide aperture, a lip-free seamless loadbay floor, and handy release levers to flip down the back seats without having to open the rear doors. The tailgate also has a useful memory function, allowing it to open to a set height; for example, in a low garage or when long items are carried on the roof and overhang. Nice to know, too, that it will re-open automatically should it detect something in the way, such as misplaced hand or paw! With the rear seats in use there's still 559 litres. An easily removed dimpled rubber boot liner will come in handy after that doggie walk in the woods. Out in the sticks mud-caked Outbacks are regularly seen towing horse boxes and the like  no surprise as it'll tow anything up to a braked 2,000kg, which gives you plenty of scope.